Buffalo Hill Farm—located fifteen miles south of Worcester—has a rich history. Built in 1910, this 130-acre farm was the former summer home of Dr. Elliott P. Joslin, founder of the Joslin Diabetes Center. The farmhouse entryway, lined with rows of stunning old oak and linden trees, was landscaped by the renowned Olmsted brothers. Wildlife habitat surrounds the farm's fertile agricultural lands, creating a valuable ecological niche as well as productive farmland. 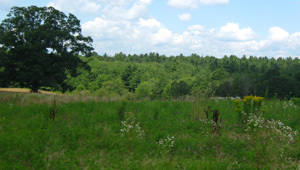 In April 2012, The Trust for Public Land purchased an Agricultural Preservation Restriction for the landowner from the Massachusetts Department of Agricultural Resources, permanently guaranteeing lease of the land exclusively for farming.